BLISTERING solo runs from wing player Arissa Romany and Karyce Baptiste on either side of the half, both of which were clinically converted by Anna-Lee Luces, were more than enough to ensure a comfortable 14-3 victory for Bishop Anstey High against impressive debutants San Juan North in the School Girls Rugby League final yesterday. The match of touch-rugby, otherwise known as tagby, was staged at the Queen's Park Savannah, Port of Spain. It followed a third-place play-off, which Providence Girls captured 21-0 over Tranquillity Secondary. Providence had one try from Anaya Almond, a pair of tries from Amartis Jawahir and a hat-trick of conversions from Kyala Simon. In the title match, former champs Bishop Anstey demonstrated their superiority under the command of captain Immanuel Francis. Bishop Anstey were clearly the better team in attack and were solid enough in defence to prevent any meaningful inroads from San Juan North. It was Bishop's effective wide play that separated the teams. Francis, 16, who is also a full-contact player with Caribs RFC, said the result had extra significance considering the number of younger players who got their first taste of rugby this season. "Senior players age off and they start looking for new players, so that has been a challenge. It took a good bit of preparation (to win the league)," she said. The leading try scorer this season added, "So this was a really big goal for us, especially to teach the younger players how to play and knowing that when we (senior players) leave (they'll be able to step up)." San Juan North may opt to take a closer look at their catching as much of their advanced movements were abruptly shut down due to an excessive number of turn-overs, resulting from incessant knock-ons. It took about midway into the roughly 15-minute first half for Bishop to take the advantage. After a quick pass found the palms of Romany, she made an unexpected turn and moved swiftly to the right flank before making a successful darting run en route to the try line with her opponents left in the dust. Romany also managed to score between the posts, making for an easy conversion from Luces, the Bishop's ever-reliable number-10 and designated kicker. At the turn of the second half, San Juan North maintained spells of possession in Bishop's half but never looked likely to score. 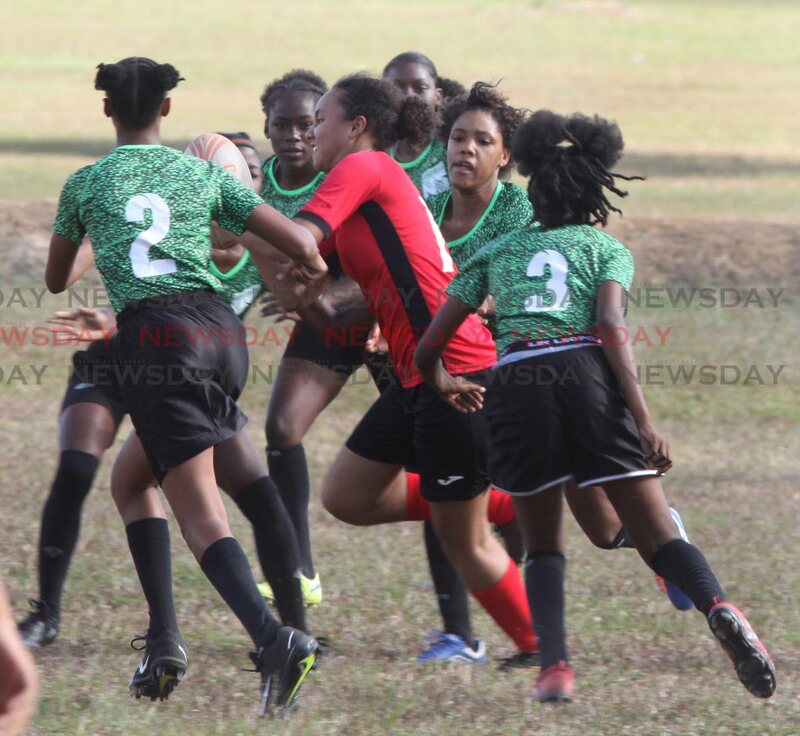 The green-clad girls did, however, find themselves on the score sheet after Akilah Gomez converted a penalty, resulting from a Bishop offside. After pulling themselves back into the match, San Juan North were quickly caught off guard in one of the final moments of the match when Baptiste, like Romany did in the first half, skipped past several challenges and awed the small crowd with a brilliant mazy run past the finish line. "We had to train more – not only in terms of skill, but the rules of the game etcetera, because they were very serious about that this year," the Bishop captain beamed. Kwanieze John, the league's administrator, gave her thoughts on the season and the impact of the league on the players. She said, "Over the years we've noted the participation in terms of the number of teams...We're happy that there's still consistency with our core teams but we do see teams coming in and out. It's been a good season for us." John, a member of TT's women's rugby team, added, "We continue working with the coaches to improve the standard to play. We're happy with what we're seeing so far but there is always room for improvement. And what we're seeing as well is that the girls, they've started playing contact. They're coming back and getting more girls involved in the game, so we're really happy about that. "I can't express how important it is (a feeder for the national women's programme) because we've seen the transition from some of the girls, not all of them, but there are a few who have come through or are part of the national squad, as well as venturing into coaching and refereeing and administration," she added. Reply to "Bishop Anstey crowned school rugby champs"